The trouble with doing a daily experiment is that some items need to wait a little longer before they can be seen. So today I did some experiments with natural dyes with the students at Whitireia Polytech. The results won't be available till tomorrow but in the meantime here are more discharge paste results. Yesterday I showed the results of discharge paste on different fabrics. I used the paste 'straight' with no additives and it discharged to different colours depending on the underlying fabric. Then I tried mixing pigments (the pigments that are usually mixed with screenprinting medium) with the discharge paste. 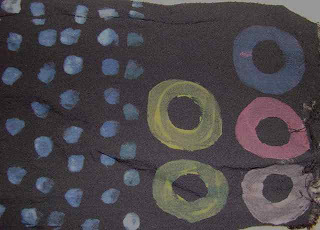 When the fabric is discharged, the pigments take the place of the colour that is removed. I just painted or stamped the pigmented discharge paste onto the fabric and I had to wait till today for the paste to dry as it was quite thick. The top piece of fabric is the black silk which discharged to white on day 3. The purple with a shocking pink circle is purple velour discharged with paste mixed with fluorescent pink pigment. We also discovered today that this brand of discharge paste is no good 48 hours after it is mixed up. I showed some students how to use it and raved about how good it was and then it didn't work I'll mix them some more tomorrow or next Tuesday. 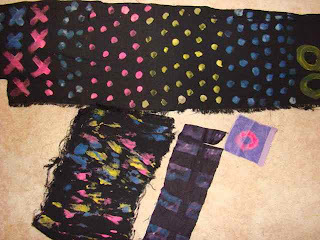 The results of a dye evening with the Venturers (older scouts) are also becoming available as people wash out their fabrics. The Venturers wanted to make real hippy tie dye spirals and circles. Here is my demonstration spiral to show the kids how to do it. 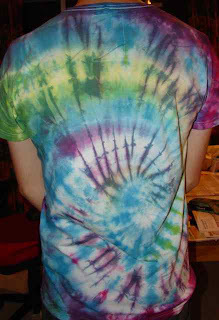 Here is the back of my son's shirt which he liked so much that he put on while it is still slightly damp! 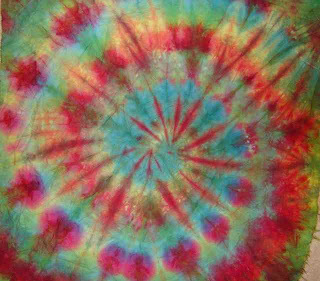 The rest of the Venturers will (hopefully) remember to bring in the results of their tie dye session on Monday next week.